Whether you prefer watching the St. Louis Cardinals score a lot of runs or continuing more of this year’s stellar pitching, you were happy with Saturday’s doubleheader. In fact, with scoring 15 runs and giving up only 1 in the day’s sweep of the San Francisco Giants, every Cardinals fan should be plenty pleased. Come on — even Ty Wigginton went 2 for 3 with 2 RBI in the second game. Thankfully, that was far from the day’s highlight. In game one, the Cardinals had a third inning that was very reminiscent of April 7 against the Giants in San Francisco — except this time the Cards only scored 7 runs in the inning off Matt Cain instead of 9. However, 16 runs in 2 of the innings he’s pitched against them this season? Pretty productive. Twelve batters came to the plate in the third inning, with the dynamic duo of Daniel Descalso and Pete Kozma getting things started with a double and a single. Shelby Miller then sacrificed Koz to second before Matt Carpenter got the scoring started. It continued when Jon Jay singled, Allen Craig singled and Matt Adams singled with three more runs scoring. And all of that was great — but Tony Cruz’s double was fantastic. Not just because it’s terrific to see him come through when he doesn’t play much and not just because he drove in two runs, even though both of those were very nice. But seeing Yadi cheering the most in the dugout was plain awesomeness. Check it out here. Yet the inning wasn’t over, as Descalso came up for the second time and got his second hit in the inning — this time an RBI single to score Cruz. Kozma went 2 for 2 in the inning also, until Shelby ended the fun by striking out. That was OK — he more than made up for his cold bat on the pitcher’s mound. He went 7 innings and struck out 7, giving up 6 hits and walking one. He lowered his ERA to 1.82, which is now second in the National League. After a scoreless inning from Victor Marte (not sure who’s hated more by the Twitter crowd — him or Wigginton), Keith Butler made his major league debut with an obviously scoreless ninth. He picked up his first big league K also. 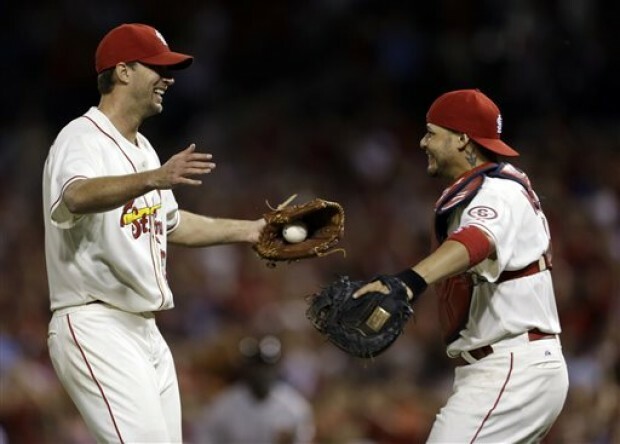 And K’s were plenty in game 2 also, as Adam Wainwright had another Wainwright game yet again. You know, just another complete game with 10 strikeouts and no walks while allowing only one run on 8 hits while lowering his ERA to 2.33. That’s all. Plus he received what John Rooney called “the kind of wave I like at the ballpark” — a standing ovation before his final at-bat in the bottom of the eighth. On offense for the Cards, it was again the third inning that got things going, this time off Madison Bumgarner. With one out, Kozma walked and Waino slugged a double. Jay hit a run-scoring fielder’s choice that moved Wainwright up to third, then he and Jay both scored when Carlos Beltran singled. Three runs in the third! All in all, a successful day — plus it gave the Cardinals another series win and gives them a good start in June. They’ll go for the sweep this afternoon at 1:15 p.m., with Tyler Lyons getting the start against Chad Gaudin. This entry was posted in 2013 Season and tagged Adam Wainwright, Allen Craig, Daniel Descalso, Jon Jay, Keith Butler, Matt Adams, Matt Cain, Matt Carpenter, Pete Kozma, San Francisco Giants, Shelby Miller, St. Louis Cardinals, Tony Cruz, Ty Wigginton, Victor Marte, Yadier Molina by Christine Coleman. Bookmark the permalink.